Foldaway shopping tote bags are manufactured using a 210D polyester material. 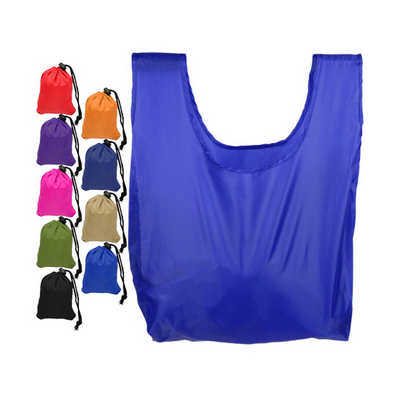 This foldaway shopping tote bag features a drawstring to fold into small size when Its not in use. If youre looking for a smaller bag as a giveaway item, then these might be a good option. They still have a good print area and it`s another way to get rid of plastic bags, when people reuse ones like this to carry their purchases Material - 210D Polyester Colours - Red, Yellow, Blue, Purple, Black, Green, Orange, Magenta, White, Over 20+ colours, please contact us for more options Product size - Unfolded: 38 x 58 cm, include handle 188mm(H) Folded: 8 x 11 cm Gusset: 8cm Print size - Unfolded: 20 x 24 cm Folded: 6 x 8cm. Price includes : 3wk 1 col/pos print. Setup is included.